Pilots should familiarise themselves with the Standard Operating Procedure (SOP), both for the airline in general and those specific to the Jetstream 41. We also highly recommend pilots complete the tutorial PMDG included, which will enhance your understanding of the aircraft and teach you the essentials of managing the engines. Issues with starting the TPE331 engine usually stem from misunderstandings regarding propeller blade pitch angle. On most turboprops (those with a free power turbine), prop pitch makes no difference to engine start. However, on geared turboprop engines, such as those fitted to the Jetstream 41, the propeller blades must be set to fully fine pitch. • Top is a fully fine (and unfeathered) propeller. It minimizes the effort required to turn the propeller. The flat face faces forwards. • Bottom is a feathered propeller. It minimizes drag in flight from a failed engine. The sharp edge faces forwards. As a safety feature, many props will automatically feather in the event of engine failure, as this configuration provides minimal drag in flight. The J41 has a mechanical Negative Torque Sensing (NTS) which partially feathers the propeller when it senses the engine is not running. Unfortunately, the propeller must be at fully fine pitch for engine start; the starter motors are not powerful enough to rotate the engine at a sufficient RPM for starting when the propellers are feathered, and operating the starter with a feathered propeller can result in damage to the starter motor or shaft. 1. To prevent operation of NTS and keep the propeller at fine pitch, there are Start Locks. The start locks are engaged during engine shutdown by moving the thrust lever to full reverse as the engine/propeller slows down through 50% RPM. The thrust levers should be returned to ground idle once the engine has stopped turning. You must shut the engines down using the guarded STOP buttons on the overhead; using the condition levers (or a keyboard shortcut) to cut off fuel is for in-flight emergency shutdown only and will make the propellers feather! 2. If you forget to engage the start locks during engine shutdown, the propellers will need to be unfeathered and placed on the start locks before starting the engine. In reality, this will result in the other pilot laughing at you; unfeathering requires the use of a hydraulic hand pump located under a hatch in the cockpit floor, and a few minutes of vigorous pumping. Someone must stand outside and watch the propellers to tell you when they are fully fine. In the simulator, the electric unfeather pump can be used instead (in reality this is only used to unfeather the propellers for in-flight restarting). Place the thrust levers in to full reverse and set the condition levers to taxi. Ensure electrical power is available. Toggle the unfeather switch (on the pedestal) left and right. Confirm visually the propellers are unfeathered, and then return the thrust levers to idle. 3. 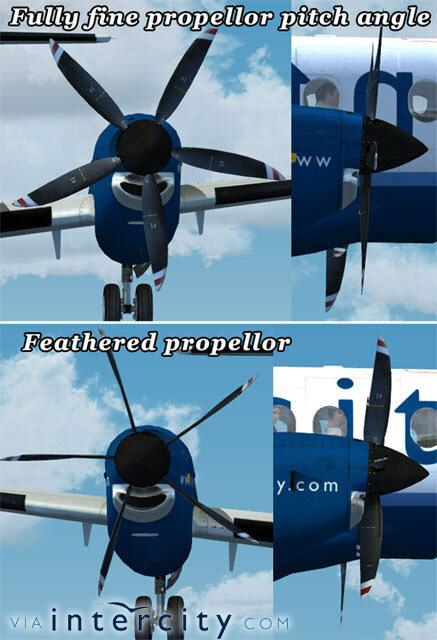 Before engine start, visually confirm both propellers are unfeathered and engine EGT is below 200°c. Turn on Standby Fuel Pumps, confirm condition levers are set to taxi and thrust levers to idle. Now you can start the engines (not forgetting to turn on the beacon lights, obtain permission from ATC and ground crew etc). 4. Once both engines are stabilized, the standby fuel pumps should be switched off. The start locks MUST be disengaged before takeoff as they prevent the propeller producing full thrust. Disengage the start locks by moving the thrust levers in to the reverse range, in the simulator the first officer will announce "start locks removed", at which point the thrust levers can be returned to idle. NB: When on the ground, once the engine has stopped turning or the unfeather pump stopped running, it can take a minute or so before the NTS system will feather the propeller, please don't be caught out by this time delay! NB: The PMDG J41 was not designed to be loaded cold/dark and this can cause problems. If you are still having problems after following the above instructions, then load the aircraft with engines running and shut it down yourself before attempting an engine start. More details on this can be found later in this document under the heading "Loading cold and dark". • EGT must be below 200°c before commencing engine start, otherwise the engines will exceed the EGT VRL (Exhaust Gas Temperature Variable Red Line) temperature during engine start, which may lead to engine fire. Also, the condition levers should be set to taxi RPM (72%) throughout starting. The cooling time can be decreased by performing a ventilation run, the technique for which is discussed in the AOM, but basically consists of motoring the engine for up to 30 seconds, without introducing fuel or ignition, in order to draw cool air through the engine. • The engine is cooled by the air flowing through it, at taxi RPM (72%) there is less cooling air than at flight RPM (95-100%). Do not command more than 35% torque from the thrust levers whilst the condition levers are at taxi, 72% RPM; if you do so there is not enough cooling to remove the heat produced by the increased fuel flow, EGT will exceed VRL, and a fire will ensue. Takeoff is always performed at 100% RPM. • As discussed above, reducing air flow through the engine will cause it to run hotter. Before reducing engine RPM with the condition levers, ensure the engines are not operating within 50°c of EGT VRL, and retard the condition levers gradually whilst monitoring EGT. Before setting climb power (normally as part of the after takeoff checklist), adjust engine thrust so that EGT is at the cooler green checkmark on the EGT display. Once RPM is stable, thrust/torque maybe increased back to the EGT VRL. • The engine and elevator anti-ice system is powered by high pressure hot air, which is drawn from within the compressor stages of the engines. This reduces the flow of cool air in to the engine core and will cause it to run hotter. If the engines are operating within 50°c of EGT VRL, thrust should be reduced until EGT lowers to the cooler green check mark on the EGT display, before activating engine and elevator anti ice. We recommend you use the loadsheet included with the PMDG Jetstream 41: set the 'Flight Duration' in decimal hours on the left and adjust the 'Fuel (-taxi)' so that the 'Landing Fuel' reads 1200 lbs. You can then load the 'Fuel (-taxi)' amount using the Fuel and Payload function from the FSX menu. The above (trip fuel plus 1200-1400 lbs) should cover most circumstances, but remember that you must land with at least 450 lbs remaining or declare an emergency; so if you have nominated a distant alternate or believe you will need to hold for a long time, you should add more fuel. A fuel planner is also available at FuelPlanner.com. The Jetstream 41 is fitted with a variety of anti-ice measures, which in turn have a variety of operating procedures attached. Typical Jetstream 41 cruising altitudes will mean spending a significant amount of time in icing conditions, so it is important pilots understand the procedures for dealing with them in this aircraft. The reason you need to worry about moisture above 0°c is because air pressure drops as it is accelerated in a jet engine intake or piston engine carburetor, causing a corresponding temperature drop; even though the ambient temperature is above freezing it may be below freezing in the intake. Hot conditions do not preclude the formation of ice, 30°c at sea level is 0°c at FL150. WHEN SHOULD I USE ANTI-ICE AND DE-ICE MEASURES? Whenever the crew expects the aircraft to encounter icing conditions, the anti-ice systems should be activated as detailed later and the aircraft should not enter icing conditions unprotected. De-ice systems should be monitored and used as required. The J41 is fitted with an advanced ice detection system that is highly sensitive (sometimes to the point of being an annoyance) and will generally detect ice before any visible traces form on the aircraft. If ICE DETECT illuminates on the CAP, then anti-ice measures must be activated. Engine anti-ice is provided by taking bleed air (hot, high pressure air from within the compression stage of the engine) and feeding it in to the metal engine air intake to heat it substantially above freezing point. Elevator anti-ice is provided by electric heater mats. ENGINE AND ELEV ANTI-ICE should be selected ON in icing conditions. The system should not be used on the ground for more than 10 seconds. If the engines are operating within 50°c of EGT VRL (Exhaust Gas Temperature Variable Red Line), torque/thrust should be reduced until EGT lowers to the cooler green check mark on the EGT display, before activating engine and elevator anti ice, as it uses results in a significant increase in EGT. Once the system is selected on, thrust/torque maybe increased back up to the EGT VRL. The increased EGT may result thrust/torque being limited to such an extent that climb performance becomes sluggish. If ICE AOA ON and <700 fpm at 180 KIAS, you may increase upto 100% RPM and then increase torque to EGT VRL (for more details on power settings, please see J41 SOP). The leading edges of the wings and tail are fitted with black rubber pneumatic boots, which are inflated periodically causing any ice on them to crack and break away (known as shedding). In the J41 the de-icing boots are not on an automatic timer. Pressing the Airframe de-ice button to AUTO will result in ONE de-ice cycle being performed; the button should only be pressed when sufficient ice has gathered on the leading edges, otherwise ice can form on the inflated boot which will prevent them from removing ice (ice bridging). In reality, pilots check there is enough ice to shed by looking at depth gauges on the wing leading edges; the J41 shows visual accumulation of ice (depending on your settings, please see the Flickering Screen item in this FAQ). Whenever anti-ice measures are activated, the ICE AOA button will illuminate. You can turn the light off by pressing the button after anti-ice systems have been deactivated. The purpose of the ICE AOA light is to remind the pilot there may be some ice build up on the wings and tail, and this will impact aircraft performance (such as increasing the stall speed), so icing reference speeds should be used. When lit, it adjusts the stall warning system to operate at a lower angle of attack then when the aircraft would stall without ice. SETTING CRUISE POWER (thanks to osuav8r of Airline Pilot Forums). 290 ktas will gives around 800-1000 lbs/hr. NB: Cruising too low will result in a reduced TAS and late arrival! Icing conditions can result in an asthmatic climb, you may increase RPM and torque to punch through the icing layer (for more details on power settings, please see J41 SOP). The documentation provided by PMDG does not include any tables or graphs detailing runway requirements or range, and it can be difficult to find this information on the internet. Below are the most comprehensive graphs we can find. Note that PMDG models the 1650 SHP engines. WHAT IS APR (AUTOMATIC PERFORMANCE RESERVE)? When armed, the Automatic Performance Reserve (APR) system attempts reigniting a flamed-out engine until 45% RPM, then autofeathers it. It will also increase available torque/thrust from the remaining running engine. APR increases torque by temporarily raising the engine EGT VRL (Variable Red Line) by 40'c and then increasing fuel flow to the live engine (using the Fuel Enrichment Valve that is normally used for engine start). The APR arming toggle switch is located in the very centre of the flightdeck, above the engine instrumentation. Below this is a "PUSH TO O/RIDE" button forces the APR system to operate (this is used for testing the system), this button light whenever the APR system is operating. APR should not operate for than 10 minutes, otherwise the engines may be damaged. Each minute of APR operation adds 300 minutes to the engine run time, and every APR operation adds 12 cycles, such is the stress it places on the engines! WHEN SHOULD APR BE ARMED? • APR is armed and tested after the first engine start of the day (if not required for takeoff, it is then disarmed); the test is performed with thrust levers at idle, and a successful test is indicated by increasing EGT and Fuel Flow. • APR is armed for selected takeoffs; in reality flight crews use a lookup table that says if APR is needed for a particular airport runway, in the simulator this is a the captain's discretion but generally it is armed when operating from shorter runways at high weights or temperatures. Reduced torque takeoffs are not permitted if APR is armed. If you experience a flickering screen or other odd visual artefacts, this is caused by your graphics card not supporting the ice visualization technology utilized in the virtual cockpit. • Open the PMDG Jetstream 41 Configuration Manager and select Virtual Cockpit Model Options to Medium or Low. Unfortunately, this fix disables visual icing effects from within the virtual cockpit; pilots will need to switch to external views to check for ice accumulation on the airframe. Please note the two above methods do not actually load the aircraft cold and dark, they make it cold and dark after it has loaded by automatically pressing the appropriate buttons.